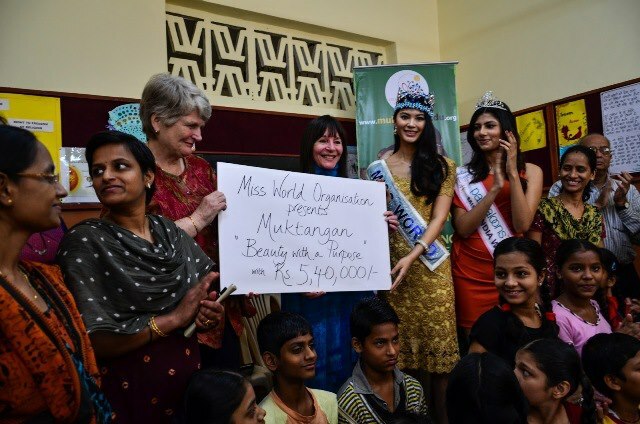 The reigning Miss World, Wenxia Yu from China, and the CEO of the Miss World Organization, Julia Morley handed over the prize of US$10 000 that Miss India won for her charity, the Muktangan Project today. Morley and Yu travelled to India to support the winning project of the Beauty With A Purpose portion of last year's Miss World Pageant. Morley works tirelessly alongside her Miss World winners every year to raise money for less fortunate people around the world in the name of the Beauty With A Purpose Charity Morley initiated to give the Miss World Pageant social relevance. The charity is now more than 40 years old and is supported by delegates, fans, and even esteemed people such as Simon Cowell, Bruce Forsyth, and the Mandela family.